The End of the Journey. 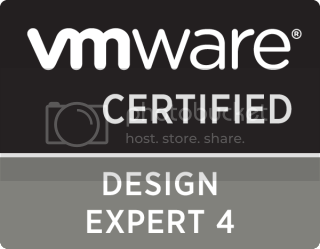 VCDX Number 46! I would also like to thank my family, friends, and those around me who personally helped me through this journey. Especially my wife, Kimberly, whose patience during this process still amazes me. The process, for me started about a year ago when I first filled out the pre-screen questionnaire for the VCDX. I knew the journey would be long and arduous, but it’s hard to explain how difficult, stressful, and ultimately rewarding this process is. To my non-virtualization friends and family, I felt almost like Chandler from Friends during the process. Nobody really knew what I did. They just knew that I was gone studying for long periods of time and I started putting a little “v” in front of everything I said . I want to discuss the most difficult portion of the process, my VCDX defense. We were discussing this in the office today. The Application / Defense portion of the VCDX journey could be considered to make up about 90% of the difficulty and stress. Don’t get me wrong, the tests are no “walk in the park”, but the Application / Defense is just crazy. I know others have said it, but set aside around 30 to 40 hours to get your application and design docs squared away. I took every bit of that and I still felt that I could have done more . Make sure you “at least” address ALL of the documentation that VMware asks for in your application and design documents and if it is on your application, it had better be in your design documents as well. The application is not a substitute for good, solid documentation. It is just a guide for the panelists to use during your defense. Once I had the Application / Design docs submitted it was time to schedule my actual panel defense for the week before VMworld. This thing is intense, folks. In the weeks leading up to my defense, I couldn’t sleep very well because I had been playing out possible questions in my head every time I tried. I prepared when I could during the day and prepared even more by night. As others have stressed, “Know your design inside, outside, frontwards, and backwards.” Know the reasons for your decisions. It’s all about the journey, not necessarily the destination (although having a rockstar destination for your design doesn’t hurt). When I arrived in Palo Alto for my defense, I was escorted to the room I affectionately refer to as the “pre-VCDX holding tank,” where I was told to relax while I wait for my turn to defend. “Relax" Yeah, right. Everyone had told me to not be too nervous, but I couldn’t help it. As soon as I set foot in the panelist room and saw the three individuals who would be questioning me for the next few hours about every detail of my design, my nerves got the best of me. My voice was hurried through the Executive Overview portion of the panel, but by the time I got to the actual defense portion, I had calmed. The panelists were very professional and fair. That helped my nerves a lot. After the actual defense portion, I got a 10 to 15 minute break and it was time for the Design Scenario. I was used to this kind of situation from dealing with clients on a daily basis. However, even that client experience would not prepare me for taking a virtualization design journey in thirty minutes. Good designs can take weeks. Notice, I said “journey” and not “destination.” I don’t think it would be feasible for you to be expected to come up with a complete design in thirty minutes. The best advice I can give is relax, read the scenario, keep the customer requirements in mind, and think out loud during the process. Whiteboard, whiteboard, whiteboard. It is your best tool at your disposal during the panel session. Use it! After the Design Scenario, came the Troubleshooting Scenario. This lasts 15 minutes. I have heard that some reach a final solution during this phase (that is ideal, but not necessary) and some do not. Again, it is about the journey, not the destination. Show the panelists your thought process through the judicious use of the whiteboard. Diagram, document, discuss. I cannot stress this enough. Pretend you are in front of a customer and that will help. I know a lot of this has already been said, but for me it helps when the ideas are reinforced by others experiences, so this has been a summary of mine. I hope this helps with any future VCDX candidate that is out there. Oh, I forgot about the most important part of the VCDX process. Analogous to whiteboard, whiteboard, whiteboard. After the VCDX defense is done: Beer, Beer Beer! It’s the best tool at your disposal to decompress after the panel session . Don’t forget to have fun during the process and after it’s over. You will have earned it! Way to go Harley… Wonderful news and congratulations. You most definitely deserve VCDX! Thanks Everyone! This has been a long process and I am honored to be counted among the talented VCDX community.